Watts, Watts and Co. Ltd.
Westcott and Lawrence Line Ltd.
John H. Whitaker (Tankers), Ltd.
C.M. Willie & Co. (Shipping) Ltd.
it is said that the firm was established in 1919). In any case Walford ran a coastal and river shipping business, operating – for instance – a route between London and Dordrecht in the Netherlands. There was also an Agence Maritime Walford in Antwerp (founded in 1902, according to one source, and dissolved in 1919) which was involved in the foundation of the Compagnie Maritime Belge. A short Danzig episode however is well documented. In October 1921 the Norwegian company Bergenske cooperated with Walford Baltic Transports Ltd (1920-1922, founded by Leopold Walford) in establishing the Bergenske & Walford Baltic Transports Ltd, active in shipping wood. The firm’s warehouse was called Bergford, a name derived from the two parent companies and retained when Walford withdrew after only one year of involvement. The above account is not very consistent due to lack of facts; the house flag is rather bewildering as well. It is blue and bears what seems to be a red ground sloping away to the right. On this slope is placed a large red saltire, near the hoist and touching the flag’s upper edge; in the fly above the slope appear red initials W and L.
Warbler Shipping Ltd., Lowestoft - horizontal orange - blue - orange flag, in center black "W". Watts, Watts & Co. Ltd. Originated as Watts, Ward & Co. with flag shown under this name by LJC 1885 and Griffin 1895. It changed its name in 1896 but in 1894/5 they had formed Britain Steamship Co. Ltd. and it is through them that the fleet was registered. Bibby Line are noted as taking over Britain Steamship in 1967 but it is not clear whether this also involved Watts, Watts & Co. Ltd. as these latter two are still being shown in association by Lloyds Shipowners in 1970. Britain S.S. Co. (Watts Watts Co. Ltd.), London: Larousse Commercial Illustré (1930) shows a white flag, a blue letter `W' (without serifs) in the centre. Sandy Hook (illustrator for Larousse) draws a somewhat wider `W', taking up about one third of the flag's length. J.H. Welsford & Company, Limited, Liverpool - white flag - red Maltese Cross. From the website of the National Maritime Museum, the house flag of the Westcott and Lawrence Line Ltd., London. A blue rectangular flag with the yellow initials 'W & L' (Westcott and Lawrence) and a blue pennant above bearing the white initials 'JRE' (Ellerman lines). The pennant and flag are made of a wool and synthetic fibre bunting. They have cotton hoists and are machine sewn. The Ellerman's initials are printed. The pennant and flag are on a single rope with a toggle attached." From the website of the National Maritime Museum, the house flag of Western Ferries (Clyde) Ltd., Glasgow. A blue rectangular flag with a white disc in the centre. The disc bears a red logo on two arrows pointing in opposite directions attached to a circle. The flag is made of a wool and synthetic fibre bunting. It has a cotton hoist and is machine sewn. The central motif is made of polyester cotton fabric. A rope and toggle is attached." White with a whide blue border all around and a red lozenge centered. Very maritime-looking. The red lozenge represents the Isle of Wight, which is diamond shaped. In fact the lozenge has a small “nick” out of it to represent the estuary of the River Medina. The whole flag is an adaptation of the "W" flag from the International Code of Signals, and the former livery of Wightlink ferries had the name "WIGHTLINK" spelled out in painted signal flags but with the house flag substituted for the "W" flag. C.M. Willie & Co. (Shipping) Ltd., Cardiff - horizontal white over green; on white red dragon. Witherington & Everett, Newcastle-on-Tyne - red flag, white "W&E". John H. Whitaker (Tankers), Ltd., Hull - vertical red-green burgee; on red black disk, white "W". Woods, Tylor & Brown, London - white flag, red knotted rope. White with a blue and white logo centered. The logo is a disc with a very fat "W" "sailing" on wavy lines. From the website of the National Maritime Museum, the house flag of Wyre Trawlers, Fleetwood. A white rectangular flag with a red 'W' in the centre. The flag is made of a wool and synthetic fibre bunting. It has a cotton hoist and is machine sewn. A rope and toggle is attached." Fleetwood is a port in Lancashire (England). Wyre Trawlers. Appear to have originated as Wyre Steam Trawling Co. Ltd. operated by John N. Ward & Son and using a red flag with a white diamond throughout bearing a blue "W" being shown by Lloyds 1912. Ward appears to have disappeared from the scene post WW2 and in the latter 1950s the company became Wyre Trawlers Ltd. lasting until around the beginning of the 1980s. The National Maritime Museum in London keeps an enamelled badge (http://www.nmm.ac.uk/Collections/collectionsDetail.cfm?ID=JEW0300), acquired on a cruise to the Canaries in 1928, decorated with the house flag of the Yeoward Line. It is the badge of SS Avoceta, built in 1923 and sunk by a submarine in 1941. The flag is horizontally divided red-yellow-red, with the letters Y.B. in gold. The company still exists today as Yeoward (Shipping) Ltd, a member of the Yeoward group in Liverpool, and is registered as ship agents and forwarding agents. There is also a Yeoward Boatyards in Salcombe, South Devon, specialized in supply, maintenance, repair and dry storage of motor boats. On the company website, a flag similar to the one pictured on the badge is shown, but with black letters. It is highly probable that the original house flag also had black letters, which were enamelled in gold for aesthetical purpose. The original name of the company seems to have been Yeoward Bros and Bonny, which may explain the Y and B letters on the flag. A book was dedicated to the history of the Yeoward Line: Theodore W.S. Barry. Sunward by Yeoward. Granta Editions, 1994. 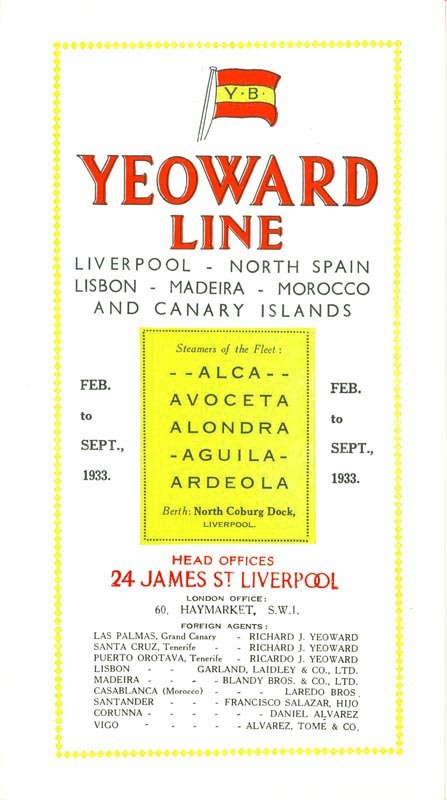 Yeoward Line originated in 1898 as Yeoward Brothers then in 1920 they formed Yeoward Line Ltd. for their ship owning which ceased around the mid 1950s. All sources agree that the yellow band was wider than the red ones whilst Talbot-Booth states that there were actual variations as to whether the letters had dots after them, no dots at all or a hyphen between them. There seems to be no agreement as to how the letters are written: www.mysticseaport.org shows the flag with dots, no hyphen. On their timetable, the company shows "hovering dots". Merseyside Views shows no dots. The funnel on the Ships List shows just a letter Y. From the website of the National Maritime Museum, the house flag of Zillah Shipping Co. Ltd, Liverpool. A blue, white blue tricolour with a red 'Z' in the centre. The flag is made of a wool and synthetic fibre bunting. It has a cotton hoist and is machine sewn. A rope and toggle is attached. The company originally comprised the fleet of William A. Savage & Co. Ltd of Liverpool. After being bought by Coast lines in 1949, a new company was set up under the name of Zillah Shipping Co. Ltd and Savage's 15 steam coasters were transferred to it. The steamers were replaced by motorships between 1954 and 1958. The company was sold outright to Coast Lines in 1967 and its fleet was sold or absorbed." Brown (1951) has for Zillah Shipping & Carrying Co., Ltd., Liverpool a houseflag with a white field charged with letters ZLTD in varying sizes and dots under the T and D.
I may be wrong about some of the details as it is many years since I read the original article from which I now quote, but William A Savage, the original founder of the Zillah Line, came from a very prominent Nonconformist (i e, not affiliated with the Church of England) family in the Liverpool area; I can no longer recall to which denomination they belonged - Baptist, Methodist, Quaker, Congregationalist, etc. Most of the members of this denomination tended not only to intermarry with one another but also to give their children Biblical forenames, usually drawn from the Old Testament. William's parents were unusual in that they named him after the reigning sovereign (William IV), although his middle name was Biblical. Zillah was William's mother's name.